With the downhill assist control system, the vehicle is able to descend a steep hill, maintaining a constant low speed of about 3 mph (5 km/h) without brake pedal operation. 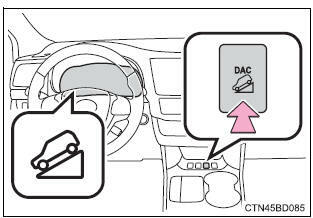 Activating the downhill assist control system press the �dac� switch. The downhill assist control system indicator will come on to indicate that the downhill assist control system is activated. Pressing the switch again turns the system off. The slip indicator will flash to indicate that the downhill assist control system is operating, and the stop lights and high mounted stoplight will turn on. The shift lever is not in 1 range of s mode or r.
The vehicle speed is higher than 15 mph (25 km/h). If the accelerator or brake pedal is depressed, the downhill assist control system will stop operating with the downhill assist control system indicator still on. The downhill assist control system gradually ceases operation. The downhill assist control system indicator will flash during the canceling operation, and then go off when the system is fully off. ?A sound may be heard from the engine compartment during operation of the downhill assist control system. This sound does not indicate a malfunction. If the accelerator or brake pedal is depressed during operation of the downhill assist control system, a sound caused by the release of system operation may be heard, or you may feel the brake pedal push-back. This does not indicate a malfunction. Do not rely too heavily on the downhill assist control system. On extremely steep inclines, icy surfaces or muddy roads, the vehicle may slip and the system may not be able to maintain the constant low vehicle speed of about 3 mph (5 km/h), leading to an accident causing death or serious injury. 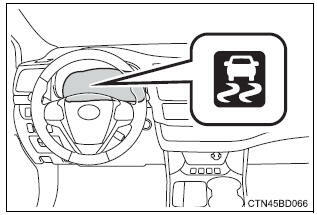 Do not shift the shift lever to r while driving forward, or to d while driving backward. Doing so may cause the wheels to lock up, leading to an accident causing death or serious injury. In addition, excessive stress will be applied to the automatic transmission, possibly resulting in damage.